Mission San Luis Obispo de Tolosa was founded on September 1, 1772 by Father Junípero Serra on a site located halfway between Santa Barbara and Monterey. A cross was erected near San Luis Obispo Creek and Father Serra celebrated the first mass at the site. The mission was named after Saint Louis of Anjou, the Bishop of Toulouse and is was fifth in the California Mission Chain. The Mission church is unusual in its design having two naves of approximately equal size. The secondary nave of the church is situated to the right of the altar, thus making this the only "L"-shaped mission church among all California Missions. The site where the mission stands was originally discovered in 1772 by Gaspar de Portolà in an exploratory expedition and nicknamed by Father Juan Crespi, a diarist, as the "Cañada de los Osos", in English the "Valley of the Bears". The discovered area was forgotten until food supplies started to dwindle and Father Serra sent there an hunting expedition to kill the bears in order to feed the Spaniards and the Indian Converts. The hunting expedition was so highly successful that Father Serra decided the construction of a new mission in the area. Furthermore, the soil was fertile and the nearby local Indians, the Chumash tribe, were friendly and helpful. The day after the foundation of San Luis Obispo Mission, Father Serra had to return to San Diego and Father Jose Cavaller was put in charge of the construction of the new mission. Father Cavaller began the construction with the help of five Spanish soldiers and two neophytes or recently Indian Converts. The Chumash Indians soon started to help the missionaries in the construction of the mission, erecting palisades and wooden buildings as temporary shelters. However, the wooden buildings were set ablaze by other Indian tribes who lived south of the mission and were determined to free the area from the new settlers. These hostile Indian tribes set the buildings on fire three times before Father Cavaller started to rebuild the mission using tile structures and adobe. The missionaries also developed red roofing tiles, similar to what they remembered from Europe, which all the missions quickly copied. Besides giving the missions protection from fire raids, the tile roof also kept the building interiors shielded from the rains. Extensive building works, whose structures are still visible today, were begun in 1794. In 1819, the quadrangle was completed and, a year later, the vestibule was added followed soon after by the arrival of two mission bells from Lima, Peru. The year 1820 also marked the end of improvements made to Mission San Luis Obispo de Tolosa. In 1842, Father Ramon Abella, the last Franciscan Missionary living at the mission, passed away. In 1845, Governor Pío Pico sold everything except the church for a total of $510. During the secularization period, the Mission rapidly fell into ruins and the priests still living there had to support themselves by letting rooms to travelers and alike. Modernization with wood siding was done in 1868. In 1934, Mission San Luis Obispo was returned to its early grace and beauty thanks to major restoration works. 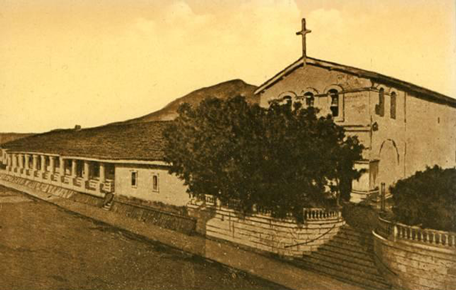 Today, San Luis Obispo Mission stands in the downtown area of the City of San Luis Obispo and is an active Roman Catholic parish church in the Diocese of Monterey.